Results, by division and overall. Please email me by Monday if you think there’s a significant error and I’ll dive into the passport pile to check it out. If you finished in the top five in the two-person divisions or top 3 in the 3-person co-ed/female but were not around to get your prize, email me. Great job yesterday! Yes, your navigation prowess, speed and skill were impressive but your effort, courage, smiles, teamwork and appreciation were what we found to be great. 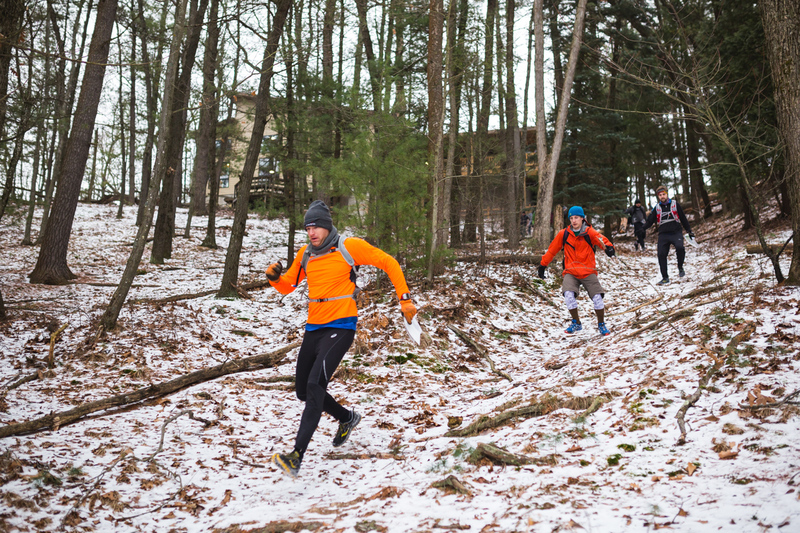 A special congratulations to the 175 first-time racers who we will now refer to as “seasoned veterans” (and hopefully expert salespeople too!). The fantastic volunteers, including those from Camp Roger. We’ll be sending your $687 in charity challenge contributions (thanks!) and a share of the race profits to their scholarship fund for kids who otherwise wouldn’t be able to go to summer camp. Another way to support Camp Roger’s good causes is Joe’s Big Race, an adventure race on April 22 with a totally different but fun format. Our great sponsors: Spectrum Health, Gazelle Sports, Honey Creek Inn, Salomon, West Michigan Bike & Fitness, Bill & Paul’s Sporthaus, Peppino’s Sports Grille, Tubbs Snowshoes, Zanfel, IceSpike, and Jamie Geysbeek Photography. And thanks to Health Motion Physical Therapy for the stretching. Local vendors for discounted goods: D&D Printing (maps). 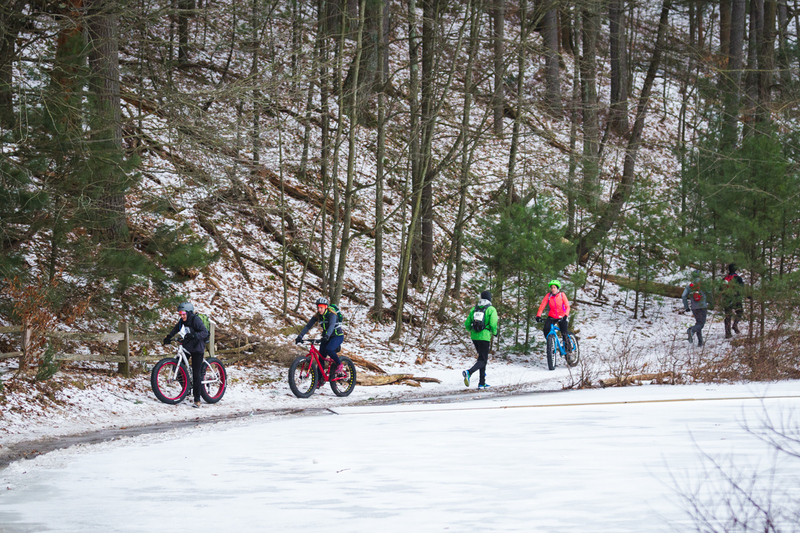 Grand Rapids Bicycle Company for fatbikes and helmets. And other partners like Bostwick Congregational Church and Lakes Elementary for the parking lot use. Those of you who brought the fatbikes, tasty sides and treats and anything else I’m forgetting. Camp Roger and Kent County Parks for use of the land. If you have a minute, post a thank you on Kent County Parks Foundation’s Facebook page and consider getting involved. Check out our new Tips page online that we’re beginning to compile from racer and our own experiences. Also make sure you review our Navigation 101/201 clinic presentation if you haven’t. It includes compass and topo map tips, but also lists way you can practice those in real life. One great way is to download the free Terrain Navigator Pro app (iphone link here; also available on Adroid I believe). 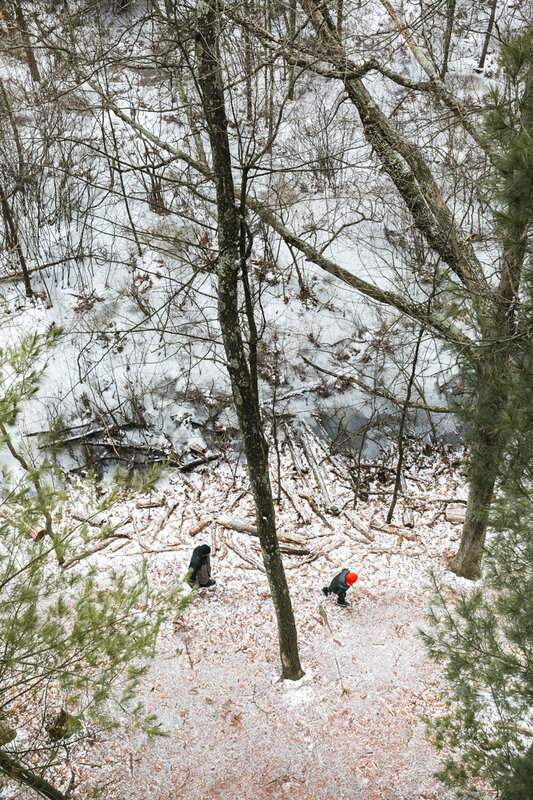 You can then hike through the woods in any public area and see how the topo map looks compared to the real terrain, plotting CPs and creating practice courses. 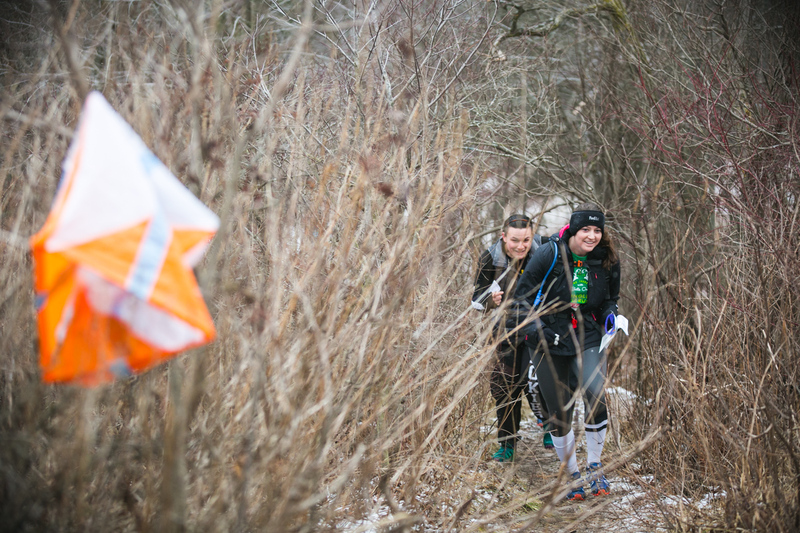 Attended the shorter orienteering events through the Southern Michigan Orieenting Club events (mostly on the east side of MI) or the upcoming Get Your Bearings adventure race (Brighton) are great ways to make your practice real. Here are the answers to the mystery puzzles. Please complete our 2-minute survey. This survey helps us improve our races and plan for the future. I read and consider every comment. Thanks to Jamie Geysbeek Photography for the race photos.The first batch is now on our Facebook page and more will come via Flickr down the road. You can download hi-res versions right from the Flickr feed! Just look for the download button and download the size you need. Thanks Jamie for providing this at no charge. Also, all MAR participants are eligible for 20% off portrait, weddings, and investments/real estate photo sessions with Jamie. Email me if you lost something and I’ll check around for it. The lost and found box is ironically lost at the moment (just temporarily in the heaping pile of race equipment I think).What’s Next? 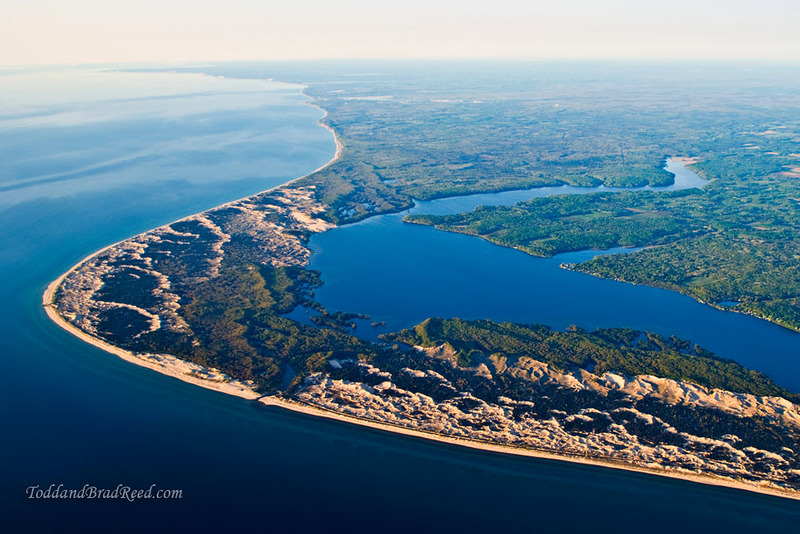 May 20 Michigan Adventure Race: Ludington Edition, 6 or 12 hours, Ludington State Park, Ludington. Early registration extended through next Sunday, 2/5. This is the largest adventure race in the U.S. for good reason – amazing terrain, breathtaking scenery, lots of definable terrain, new singletrack mountain biking trails (not technical) and a beautiful paddle section. Such a fun day with a truly classy group of people. Let’s do it again soon.